The visit will come in response to an invitation from Tajikistan's Government, and within the context of His Highness' Golden Jubilee - the Aga Khan acceded to the Ismaili Imamat on July 11 1957 and is visiting some 30 countries around the world which have long-standing and close relations with the Imamat to express his gratitude and friendship with governments, leaders, and other partners of the Aga Khan Development Network (AKDN). According to AKDN Tajikistan, during his five-day visit to Tajikistan, His Highness the Aga Khan will hold talks with a number of high-ranking Tajik state officials. His Highness the Aga Khan became Imam of the Shia Imami Ismaili Muslims on July 11, 1957 at the age of 20, succeeding his grandfather, Sir Sultan Mahomed Shah Aga Khan. He is the 49th hereditary Imam of the Shia Imami Ismaili Muslims and a direct descendant of the Prophet Muhammad (peace be upon him) through his cousin and son-in-law, Ali, the first Imam, and his wife Fatima, the Prophet's daughter. The Aga Khan is founder and Chairman of the Aga Khan Development Network (AKDN), which brings together a number of development agencies, institutions, and programs that work primarily in the poorest parts of Asia and Africa. AKDN agencies conduct their programs without regard to the faith, origin or gender. Operating in Tajikistan since 1992, AKDN draws on a strong base of experience in working with mountain societies. It works in all regions of the country and employs approximately 3,000 people through its operations and investments. AKDN works towards the vision of an economically dynamic, politically stable, intellectually vibrant, and culturally tolerant Tajikistan. This is achieved by supporting the establishment of programs and institutions that allow the government, private sector and civil society to play complementary roles in increasing prosperity and creativity within a pluralistic society. The Network brings together individual agencies that operate in a range of areas – from economic development to education, rural development to cultural revitalization, health care to financial services. Together these agencies collaborate towards a common goal - to build institutions and programs that can respond to the contemporary challenges and opportunities of social, economic and cultural growth in Tajikistan. I know the Official web site at http://www.goldenjubileetajikistan.com/darbar/ says "The Dushanbe Darbar will be held at the Dushanbe Stadium." However Dushanbe Didar date is still not confirmed. In plain English, it means that it may still be canceled. Please do not say I am saying it is canceled or not canceled, I have not said any such thing. Do not misinterpret. Tajikistan is not an easy country and having some logic in the back of the mind will not hurt. GBAO didars however looks more confirmed so if you are in Dushanbe already, try to find out what is going on about the Dushanbe dates and if necessary plan instead to attend GBAO didars to be on the safe side, just in case. DUSHANBE, October 27, 2008, Asia-Plus -- Issues related to implementation of programs of the Aga Khan Development Network (AKDN) in Tajikistan were a major topic of a meeting of Foreign Minister Hamrokhon Zarifi with Prince Amyn Aga Khan that was held in Dushanbe on October 22, according to the Tajik MFA. In the course of the talks, Zarifi and Prince Amyn Aga Khan, in particular, considered issues related to activities of the AKDN development agencies such as the Aga Khan Fund for Economic Development (AKFED), the Aga Khan Foundation (AKF) and its Mountain Societies Development Support Program (MSDSP) aimed at enhancement of education, health, energy, agrarian and tourism sectors in Tajikistan. The two discussed the progress of implementation of the projects for construction of the Dushanbe Serena Hotel and the Ismaili Center in Dushanbe, as well as construction of small power plants and transport infrastructure in Tajikistan. During the meeting, the minister drew attention of Prince Amy Aga Khan to implementation of additional projects for enhancement of Tajikistan's agrarian sector. The sides also discussed the progress of the AKDN humanitarian projects in Tajikistan, the Tajik MFA said. We will recall that Prince Amyn Aga Khan, younger brother of His Highness the Aga Khan, arrived in Dushanbe for a short visit on October 21. During his stay in Dushanbe, Prince Amyn Aga Khan reviewed the AKDN programs in Tajikistan. The Aga Khan Development Network (AKDN) brings together a number of development agencies, institutions, and programs that work primarily in the poorest parts of Asia and Africa. AKDN agencies conduct their programs without regard to the faith, origin or gender. Operating in Tajikistan since 1992, AKDN draws on a strong base of experience in working with mountain societies. It works in all regions of the country and employs approximately 3,000 people through its operations and investments. I know the web site at http://www.goldenjubileetajikistan.com/darbar/ says "The Dushanbe Darbar will be held at the Dushanbe Stadium." Further to my previous message, if you are in Dushanbe, please go to Khorog or you will probably miss all the didars. Do not wait for official announcement about didar in Dushanbe, by the time they tell you it may be canceled, it will be too late for you to go to the Badakshan Didars. Plan ahead, leave NOW, share a jeep but please do not just sit in Dushanbe waiting for Didar dates. The Jamat of Tajikistan is eagerly awaiting the commencement of Mawlana Hazar Imam's visit with anticipation and excitement. From sprucing up and the streets to holding celebratory community gatherings, members of the Jamat are preparing for the first Darbars in Tajikistan in ten years. The Gorno-Badakhshan province is home to a majority of the country's Jamat, and its administrative capital, Khorog, has been teeming with activity. In 1995, on the occasion of Mawlana Hazar Imam's first Deedar in Tajikistan, Jamati members from Khorog constructed a rock arrangement reading "Welcome Our Hazir Imam" on the side of the Pamir Mountains. Over the past few weeks, a contingent of volunteers has undertaken the arduous process of adding the words Golden Jubilee below the existing sign. After hiking up several hundred metres to the sign's location, they passed large rocks from one person to the next, to set them in place. Later, they formed a brigade to haul water up from the river, in order to brighten the words for the upcoming visit. Elsewhere, construction continues at the Khorog Park, a project of the Aga Khan Trust for Culture, while families gather around the park's newly installed benches and playground equipment. At the Aga Khan Lycée, the first private school in Gorno-Badakhshan and home to over 950 students in grades 1-11, pupils and teachers are busy cleaning and decorating their school. "We want to show Hazar Imam how the school has changed since he opened it in 1998, ten years ago," said a primary teacher at the Lycée. Students have painted the corridors and created special learning areas including a puppet theatre, art, music and nature centres and a math corner. In Dushanbe, Mawlana Hazar Imam is expected to meet senior government officials and visit AKDN projects in the city including the Dushanbe Serena Hotel and the Ismaili Centre. "People consider the Golden Jubilee visit of Mawlana Hazar Imam to Tajikistan to be a very significant, historic and unique event, as it has been celebrated by the Ismaili community during the year and brought lots of new ideas and perspectives to the community," remarked one member of the Jamat from the Zarafshon district of Dushanbe. An Ismaili teacher of Tajik language and literature echoes the sentiment of anticipation: "The first Deedar was like a dream for me," she says in reflection. "Now we are waiting consciously for the upcoming visit and I am full of thoughts, emotions and impatiently expecting to see our beloved Hazar Imam once again. This happy long-expected day is going to happen very soon." ASTANA. October 29. KAZINFORM. /Aigul Tulekbayeva/ The Aga Khan Development Network (AKDN) plans to continue its cooperation with Kazakhstan. Prince Karim Aga Khan, arriving in Astana, said at a briefing, Kazinform reports. This visit opens his 10-day Central Asian tour. “We discussed development of the Central Asian universities and issues regarding economic recession with the Kazakh President. I expressed hope for further cooperation with Kazakhstan in all spheres”, the Prince said. sphere of human resources, regional stability, promotion of pluralism and intercivilizational understanding. an affiliate of the Central Asian University. CA-NEWS (KZ) - Karim Masimov, the Prime Minister of Kazakhstan met with the Prince Karim Aga Khan IV on October 29, 2008, reports Kazinform referring to the president's press service. Parties exchanged views on wide range of social, economic and cultural developments; discussed organization and opening of University of Central Asia (AUK) in Kazakhstan in the framework of the treaty between governments of Kazakhstan, Kyrgyzstan and Tajikistan and Prince Aga Khan IV. The parties noted on importance of cooperation in education for promotion of peace and friendship, mutual trust, preservation of historical and cultural values. At the end of the meeting Prince Karim Aga Khan IV thanked the Prime minister of Kazakhstan for support of his mission in Kazakhstan. The history of the "Cinema group" beginns 1999. When the administration of the Aga Khan Humanities Project for Central Asia (AKHP) in connection with the production studio "Kinoservise" decided to train a group of students in documentary and drama films. The AKHP provided equipment for the group and "Kinoservise" invited the best professionals of cinematography in Tajikistan. 16 students from different universities of Dushanbe took part in the first master classes in: Scriptwriting, Directing, Acting, Filming, Lighting, Editing. The Jamat of Tajikistan is eagerly awaiting the commencement of Mawlana Hazar Imam’s visit with anticipation and excitement. From sprucing up the streets to holding celebratory community gatherings, members of the Jamat are preparing for the first Darbars in Tajikistan in ten years. The Gorno-Badakhshan province is home to a majority of the country’s Jamat, and its administrative capital, Khorog, has been teeming with activity. A mountain-side sign built from stones by the Khorog Jamat will welcome Mawlana Hazar Imam on his Golden Jubilee visit to Tajikistan. Photo: Gordon CummingIn 1995, on the occasion of Mawlana Hazar Imam’s first Deedar in Tajikistan, Jamati members from Khorog constructed a rock arrangement reading “Welcome Our Hazir Imam” on the side of the Pamir Mountains. Over the past few weeks, a contingent of volunteers has undertaken the arduous process of adding the words Golden Jubilee below the existing sign. After hiking up several hundred metres to the sign’s location, they passed large rocks from one person to the next, to set them in place. Later, they formed a brigade to haul water up from the river, in order to brighten the words for the upcoming visit. Elsewhere, construction continues at the Khorog Park, a project of the Aga Khan Trust for Culture, while families gather around the park’s newly installed benches and playground equipment. At the Aga Khan Lycée, the first private school in Gorno-Badakhshan and home to over 950 students in grades 1-11, pupils and teachers are busy cleaning and decorating their school. “We want to show Hazar Imam how the school has changed since he opened it in 1998, ten years ago,” said a primary teacher at the Lycée. Students have painted the corridors and created special learning areas including a puppet theatre, art, music and nature centres and a math corner. In Dushanbe, Mawlana Hazar Imam is expected to meet senior government officials and visit AKDN projects in the city including the Dushanbe Serena Hotel and the Ismaili Centre. “People consider the Golden Jubilee visit of Mawlana Hazar Imam to Tajikistan to be a very significant, historic and unique event, as it has been celebrated by the Ismaili community during the year and brought lots of new ideas and perspectives to the community,” remarked one member of the Jamat from the Zarafshon district of Dushanbe. Commencing a ten-day visit to Central Asia, Mawlana Hazar Imam arrived this evening in Astana, the capital of Kazakhstan, where he was received at the airport with a traditional Kazakh welcome from senior government officials and AKDN leaders in the region. This morning, Mawlana Hazar Imam was received by His Excellency President Nursultan Nazarbayev of Kazakhstan at the Presidential Palace in Astana. Mawlana Hazar Imam and President Nazarbayev discussed, amongst other things, the regional impact of the current global financial situation. Awarding Mawlana Hazar Imam the decoration "Honoured Educator of the Republic of Kazakhstan," the Minister of Education and Science, Dr Zhanseit Tuimebayev recognised Hazar Imam’s services to Education. Additional photos are available in the gallery. Further details on Mawlana Hazar Imam’s visit to Central Asia will continue to be posted at TheIsmaili.org. TALDYKORGAN. October 30. KAZINFORM. /Sandugash Duissenova/ Prince Karim Aga Khan IV has arrived with an official visit in Taldykorgan town today; Kazinform reports. Prince Karim Aga Khan accompanied by akim (governor) of Almaty oblast Serik Umbetov visited Tekeli town, got familiarized with the general layout of an affiliate of the Central Asian University founded by the governments of Tajikistan, Kyrgyzstan, Kazakhstan and the Ismaili Imamat. The Prince surveyed the construction site of a university town in Tekeli. The university town of 100 thousand square meters of first-class educational, sports and residential facilities was projected by Japanese architect Arata Isozaki. Over 1200 people including students, teachers and service personnel will inhabit the town. 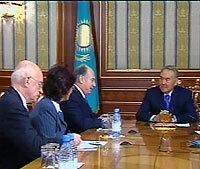 One of the World famous patrons of art, Prince Karim Aga Khan VI has paid a visit to Kazakhstan. He is one of the descendants of the Prophet Mohammed and he is also the Imam of the Muslim and Shiite community of the Ismaili. His Excellency was welcomed to the Ak Orda residence by Nursultan Nazarbayev. The Prince is also the founder and one of the sponsors of many charity projects carried out in many countries including the CIS and some Central Asian states. In particular, in 2000, Kazakhstan, Kyrgyzstan and Tajikistan as well as the Aga Khan VI fund established the Central Asian University. The University headquarters is situated in Bishkek with the educational institution's representations to be constructed in the Kazakh town of Tekeli, the Kyrgyz populated area of Naryn and the Tajik town of Khoros. Straight from Astana, his Excellency is set to go to Tekeli to take part in an official ceremony to lay the first brick of the future university. The Prince's ten-day working trip around Central Asia began in Kazakhstan. - I have come here to see how our university is developing. During the talks with the President, we also spoke about the effect the global economic recession has on Central Asia. I expressed the hope of further expansion of cooperation with your country in all possible areas. DUSHANBE, October 31, 2008, Asia-Plus -- His Highness the Aga Khan, Imam (spiritual leader) of the Shia Ismaili Muslims, and founder and Chairman of the Aga Khan Development Network (AKDN), is arriving in Dushanbe today afternoon on a six-day official visit. The Aga Khan’s visit comes at the invitation of the Government of the Republic of Tajikistan and is one of many being undertaken to commemorate his Golden Jubilee as Imam of the Ismaili Muslims. His Highness succeeded his grandfather, Sir Sultan Mahomed Shah Aga Khan, as Imam on 11 July 1957. Today, the Aga Khan will meet with Foreign Minister Hamrokhon Zarifi and President Emomali Rahmon. Discussions will include topics of mutual interest such as the ongoing partnerships between the Government of Tajikistan and the AKDN in the areas of educational, social, and economic development. In Dushanbe, His Highness the Aga Khan is also scheduled to visit current AKDN construction projects in the capital of Dushanbe, including the Serena Hotel and the Ismaili Center. The Aga Khan will continue to Gorno Badakhshan, where he will meet with members of the Ismaili community. He will visit AKDN project sites in the region, including the Khorog Park, which is currently being rehabilitated by the Aga Khan Trust for Culture, as well as the School for Professional and Continuing Education (SPCE) of the University of Central Asia (UCA). The Aga Khan’s visit to Tajikistan is part of a 10-day trip to Central Asia, including Kazakhstan and Kyrgyzstan; all three countries signed an international treaty establishing the UCA in 2000. In Kazakhstan, he will meet with President Nursultan Nazarbayev and other Government ministers as well as visit sites of the UCA main campus and SPCE in Tekeli. In Kyrgyzstan, the Aga Khan will meet with senior government representatives and will travel to Naryn to review the main campus site of the UCA and the construction of the new Town Campus that will house SPCE. It is to be noted that since Tajikistan’s independence, the Aga Khan has poured millions of dollars into the country in aid. Dushanbe, October 31. His Highness Prince Aga Khan IV, arrived in Dushanbe. In the capital airport, he met with Deputy Prime Minister Asadullo Gulomov and Minister of Foreign Affairs of the Republic of Tajikistan Hamrohon Zarifi. The visit of His Highness the Aga Khan IV is at the invitation of the Government of the Republic of Tajikistan and organized on the occasion of his Golden Jubilee as Imam of the Ismaili Muslims. According to the program of the visit, His Highness will also visit the construction sites of the Development Fund for the Aga Khan in Dushanbe. November 2, Aga Khan IV will fly to Gorno-Badakhshan’s Autonomous Region. His Highness will also fly to Ishkashim, and will hold Didor with Ismaili jamoats and will visit construction sites. At the end of his visit, the Aga Khan IV will fly to Kyrgyzstan. Posted by ismailimail in Aga Khan IV, Asia, Central Asia Visit, GJ Visits, Tajikistan. DUSHANBE, November 1, 2008, Asia-Plus - Issues related to cooperation between the Government of Tajikistan and the Aga Khan Development Network (AKDN) were the focus of a meeting of President Emomali Rahmon with His Highness the Aga Khan, Imam (spiritual leader) of the Shia Ismaili Muslims, and founder and Chairman of the AKDN here on October 31. 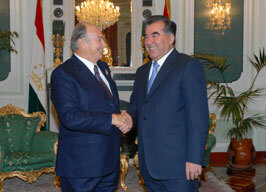 As it had been reported earlier, the Aga Khan arrived in Tajikistan on Friday for a six-day official visit. According to presidential press service, President Rahmon expressed gratitude to His Highness the Aga Khan for assistance provided with enhancing different branches of Tajikistan’s economy. Rahmon and the Aga Khan expressed satisfaction with the present level of cooperation between the AKDN and the Tajik Government in developing tourism, education, health and other areas of Tajikistan’s social sector. During the meeting, the sides expressed intention to expand cooperation in developing Tajik economy’s areas like farm produce processing, tourism and relevant industries, energy, communications, construction and road building in the future as well, the press service said. Today, His Highness the Aga Khan visited current AKDN construction projects in Dushanbe, including the Serena Hotel and the Ismaili Center. Tajikistan:The leader of the world’s Ismaili community, the Aga Khan, has been welcomed by thousands of his followers at the start of a visit to the Pamir Mountains of eastern Tajikistan. On his arrival at the region’s only airport, the Aga Khan was given the traditional welcome — he was offered salt and bread. Later in the region’s capital, Khorog, schoolchildren waved flowers and chanted songs in his honor. Mr Serik Umbetov, the Akim (Governor) of the Almaty Oblast, Kazakhstan’s largest region, today received Mawlana Hazar Imam against the picturesque mountain backdrop of the regional capital, Taldy Kurgan. Accompanied by Dr Zhanseit Tuimebayev, Kazakhstan’s Minister of Education, Hazar Imam flew to this south-eastern Kazakhstan city before travelling by road to the site where the University of Central Asia’s (UCA) Kazakhstan campus is to be built, near Tekeli. A working visit followed, during which Mawlana Hazar Imam discussed spatial planning and examined campus views from the promontory overlooking Tekeli with architects from the firm of Arata Isozaki Associates. The Akim (Mayor) of the Eskeldinski Rayon, Mr Sultan Busembinov then presented title deeds for land in the Rayon to UCA’s Director General, Dr Bohdan Krawchenko, in a brief ceremony witnessed by Mawlana Hazar Imam, Education Minister Tuimebayev and the Akim of the Almaty Oblast, Mr Umbetov. Hundreds of Tekeli’s residents, led by their Akim, Mr Serikjan Beskempirov, had gathered in the town square to greet Mawlana Hazar Imam and the other dignitaries. After opening an exhibition showing the architectural design and site development plans for the UCA campus, the distinguished guests walked across the square to the Tekeli campus of UCA’s School of Professional and Continuing Education (SPCE). Pausing at stands of the town fair organised for the occasion, Mawlana Hazar Imam acknowledged the applause of the assembled citizenry that included students of the School. Amongst those he met were young alpinists developing local mountain tourism, a subject in which the SPCE is offering courses. A highlight of Mawlana Hazar Imam’s encounters with a wide range of learners was his meeting with the oldest of the School’s students, a woman aged 74 taking an IT course. During his tour of SPCE, Hazar Imam impressed upon English teachers the value of the study of English to make Kazakh culture — like that of other societies of the Islamic world — more widely accessible. At a lunch hosted in his honour by the Akim of the Almaty Oblast in Taldy Kurgan, Mawlana Hazar Imam was presented with a ceremonial robe of honour, traditional Kazakh headgear and a dombra (stringed musical instrument) before returning to Astana in the late afternoon. In the evening, Mawlana Hazar Imam was the guest of honour of the Minister of Education at a private performance of traditional Kazakh and classical Western music. from presidential press services, tajikistan. Early this morning, Mawlana Hazar Imam set out to review the progress of the soon to be completed Ismaili Centre Dushanbe. Situated on Dushanbe’s prominent Ismoil Somoni Avenue, the Centre resonates with the architectural traditions of Central Asia. Inspired by the mausoleum of Ismoil Somoni, a national hero in Tajikistan, over 2.6 million bricks are being used in the construction of its façade and interior. Mawlana Hazar Imam then proceeded to the construction site of the Dushanbe Serena Hotel. Expected to be completed in 2009, the nine-story, state of the art facility will have 95 rooms, including suites and apartments. The hotel will include a banquet hall, meeting and dining facilities, a business centre, and a health club. It will also provide office space to meet the growing demand of organisations based in Dushanbe. Later in the day, Mawlana Hazar Imam met with His Excellency Mahmadsaid Ubaidulloev, the Mayor of Dushanbe. In the evening Mawlana Hazar Imam hosted a reception for diplomats and senior government officials. The reception was followed by an Imamat banquet in honour of the President of Tajikistan, His Excellency Emomali Rahmon. Additional photos are available in the Kazakhstan and Tajikistan galleries. Further details on Mawlana Hazar Imam’s visit to Central Asia will continue to be posted at TheIsmaili.org. Mawlana Hazar Imam departed Kazakhstan today and travelled to Dushanbe, the capital of Tajikistan, commencing a six-day visit to the country. He was received by the First Deputy Prime Minister of Tajikistan, His Excellency Asadullo Ghulomov, and the Minister of Foreign Affairs, His Excellency Hamrokhon Zarifi, as well as other senior government ministers and representatives of the Aga Khan Development Network. Following a formal afternoon meeting with Foreign Minister Zarifi, Mawlana Hazar Imam met with the President of Tajikistan, His Excellency Emomali Rahmon at the President’s Office. The two discussed prevalent trends in the region and recent developments in country. Later in the evening, Mawlana Hazar Imam attended a state banquet hosted by the President in his honour. Mawlana Hazar Imam’s trip to Tajikistan will include visits to the construction sites of the Ismaili Centre and the Serena Hotel in Dushanbe. In Gorno-Badakshan, Mawlana Hazar Imam will lay the foundation stone for the Khorog Jamatkhana and look in on the adjacent Khorog Park, which is currently being rehabilitated by the Aga Khan Trust for Culture. He will also visit the University of Central Asia’s Vocational Education Centre and is expected to grant Darbars in Porshinev and Ishkashim. KHOROG, November 3, 2008, Asia-Plus -- On November 2, His Highness the Aga Khan, Imam (spiritual leader) of the Shia Ismaili Muslims, and founder and Chairman of the Aga Khan Development Network (AKDN), arrived in Khorog, Gorno Badakhshan. Tajik First Deputy Prime Minister Asadullo Ghulomov is accompanying him on the trip to Gorno Badakhshan. Today, the Aga Khan is participating in the groundbreaking ceremony for construction of the Ismaili Center, Jamoatkhona, in Khorog and holding talks with the governors of Gorno Badakhshan and that Afghan Badakhshan province. After the talks, His Highness the Aga Khan is visiting the School for Professional and Continuing Education (SPCE) of the University of Central Asia (UCA). In Gorno Badakhshan, the Aga Khan will also meet with members of the Ismaili community. On November 4, the Aga Khan will visit the Ishkashim district and November 5, he will visit the Shugnan district. The Aga Khan’s visit comes at the invitation of the Government of Tajikistan and is one of many being undertaken to commemorate his Golden Jubilee as Imam of the Ismaili Muslims. His Highness succeeded his grandfather, Sir Sultan Mahomed Shah Aga Khan, as Imam on 11 July 1957. The Aga Khan’s visit to Tajikistan is part of a 10-day trip to Central Asia, including Kazakhstan and Kyrgyzstan; all three countries signed an international treaty establishing the UCA in 2000. In Kazakhstan, he met with President Nursultan Nazarbayev and other high-ranking Kazakh state officials as well as visited sites of the UCA main campus and SPCE in Tekeli. In Kyrgyzstan, the Aga Khan will meet with senior government representatives and will travel to Naryn to review the main campus site of the UCA and the construction of the new Town Campus that will house SPCE. KABAR, November 2. Aga Khan Prince / Imam (spiritual leader) of the Shia Ismaili Muslims, and founder and Chairman of the Aga Khan Development Network (AKDN) is now visiting Tajikistan, he arrived to Tajikistan on October 31 at the invitation of the Tajik Government. On November 5 Aga Khan Prince will arrive in Kyrgyzstan to visit construction of Aga Khan University in Naryn oblast. DUSHANBE, November 3 (Asia-Plus). Some 16 million kWh of Turkmen electricity has been supplied to Tajikistan over the past two days, according to Barqi Tojik (Tajik electric systems) power holding. DUSHANBE, November 3 (Asia-Plus). The spiritual leader of the world's Ismaili community, His Highness the Aga Khan, who is currently on his 6-day official visit to Tajikistan, on November 1 met here with Chairman of the Majlisi Milli (Tajikistan's upper chamber of parliament) also Dushanbe Mayor Mahmadsaid Ubaidulloyev. KHOROG, November 3 (Asia-Plus). On November 2, His Highness the Aga Khan, Imam (spiritual leader) of the Shia Ismaili Muslims, and founder and Chairman of the Aga Khan Development Network (AKDN), arrived in Khorog, Gorno Badakhshan. DUSHANBE, November 3 (Asia-Plus). Turkmenistan has begun supplying electrical power to Tajikistan in the autumn-winter season. DUSHANBE, November 3 (Asia-Plus). Issues related to cooperation between the Government of Tajikistan and the Aga Khan Development Network (AKDN) were the focus of a meeting of President Emomali Rahmon with His Highness the Aga Khan, Imam (spiritual leader) of the Shia Ismaili Muslims, and founder and Chairman of the AKDN here on October 31. The Aga Khan's visit comes at the invitation of the Government of Tajikistan and is one of many being undertaken to commemorate his Golden Jubilee as Imam of the Ismaili Muslims. His Highness succeeded his grandfather, Sir Sultan Mahomed Shah Aga Khan, as Imam on 11 July 1957. The Aga Khan's visit to Tajikistan is part of a 10-day trip to Central Asia, including Kazakhstan and Kyrgyzstan; all three countries signed an international treaty establishing the UCA in 2000. DUSHANBE, November 3, 2008, Asia-Plus -- The spiritual leader of the world's Ismaili community, His Highness the Aga Khan, who is currently on his 6-day official visit to Tajikistan, on November 1 met here with Chairman of the Majlisi Milli (Tajikistan's upper chamber of parliament) also Dushanbe Mayor Mahmadsaid Ubaidulloyev. Shavkat Saidov, an aide to the Majlisi Milli speaker for relations with media and NGOs, said that in the course of the talks the Aga Khan and Ubaidulloyev had discussed issues related to state and prospects of further expansion of cooperation between the Government of Tajikistan and the Aga Khan Development Network (AKDN) in implementation of different investment projects. Ubaidulloyev highly appraised the present level of bilateral cooperation and contribution of the AKDN agencies to enhancement of educational, social, and economic areas of Tajikistan. He, in particular, noted that bilateral cooperation might open new opportunities for development and implementation of new projects and programs promoting enhancement of different branches of Tajikistan's economy and social life. Ubaidulloyev also noted that participation of the AKDN agencies in reconstruction and construction of hydropower plants in Tajikistan as well as construction of the Ismaili Center and an office of the AKDN in Dushanbe, construction of world-class hotels and implementation of technical assistance and humanitarian programs were of significant importance, the aide said. The Aga Khan supported Ubaidulloyev's proposal on participation of the AKDN agencies in establishment of a school with new teaching methods in Dushanbe and programs for rehabilitation of the water supply system and roads in the Tajik capital, Saidov said. Accompanied by the First Deputy Prime Minister of Tajikistan, His Excellency Asadullo Ghulomov, Mawlana Hazar Imam travelled aboard an Aga Khan Development Network helicopter from Dushanbe to Khorog, the capital of the Gorno-Badakhshan Autonomous Oblast (province). Upon his arrival, he was received by the Governor of Gorno-Badakhshan, Qodir Qosim, and the Mayor of Khorog, Mulkamon Nazaraliev, as well as leaders of the Jamat and the Aga Khan Development Network. The citizens of Khorog greeted Mawlana Hazar Imam with a colourful Pamiri reception. Members of the Jamat dressed in ceremonial attire stood all-along a red-carpeted path. Hazar Imam was welcomed with a traditional offering of non (bread), and received gifts presented by younger members of the Jamat. As he walked along the carpet, his path was continuously showered with the petals of sweet-scented flowers. In the evening, the Governor of Gorno-Badakhshan hosted a dinner in honour of Mawlana Hazar Imam. The city streets and mountain-side signs welcoming Hazar Imam were lit up, and members of the Jamat lined the road leading to the event. The evening’s entertainment included traditional Pamiri singing, dancing, and musical performances. It was evident that the joy and excitement of the Golden Jubilee had gripped the entire city. KHOROG, November 4, 2008, Asia-Plus - On Monday November 3, His Highness the Aga Khan, Imam (spiritual leader) of the Shia Ismaili Muslims, and founder and Chairman of the Aga Khan Development Network (AKDN), attended the groundbreaking ceremony for construction of the Ismaili Cultural-Educational Center, Jamoatkhona, in Khorog, Gorno Badakhshan. Speaking at the ceremony, the Aga Khan said that the Center should promote combining efforts to develop mutual understanding and stability in the region. In cooperation with and with support of the Government of Tajikistan and President Emomali Rahmon we are taking measures to transform Khorog into the gem of the Pamirs and one of cultural-educational centers of the region, His Highness the Aga Khan said. With that end in view we began constructing this Center, the University of Central Asia (UCA) and hotels, rehabilitate central parks and implement different projects aimed at development of education and health sectors and preservation of cultural relics in the region, His Highness stressed. Speaking at the groundbreaking ceremony, the GBAO governor Qodir Qosim pointed out contribution of the Government of Tajikistan and the AKDN agencies to solution of the pressing problems facing Gorno Badakhshan in the energy, communications, agrarian and other sectors. “We are confident that the Ismaili Cultural-Educational Center will play an important role in formation and development of universal humanistic ideas,” the governor said. Tajik First Deputy Prime Minster, Asadullo Ghulomov, the Afghan Badakhshan governor and other local and foreign guests, totaling some 10,000 people, attended the ceremony. Yesterday, His Highness the Aga Khan also visited the Khorog Park, which is currently being rehabilitated by the Aga Khan Trust for Culture, and the School for Professional and Continuing Education (SPCE) of the University of Central Asia (UCA) in Khorog. Mawlana Hazar Imam also expressed a desire to continue to work in partnership with the authorities towards the development of Khorog. “Step by step, we will make Khorog the Jewel of the Pamir,” said Hazar Imam, describing his vision for the capital of Gorno-Badakhshan. Also see Mawlana Hazar Imam’s speech at the Foundation Laying Ceremony of the Ismaili Jamatkhana and Centre, Khorog. After the ceremony, government dignitaries and AKDN leaders accompanied Mawlana Hazar Imam on a tour of the adjacent Khorog Park, a rehabilitation project of the Aga Khan Trust for Culture. In the afternoon, Mawlana Hazar Imam visited the University of Central Asia’s Vocational Training Centre in Khorog. He studied work done by students pursing carpentry, stone cladding and plaster construction. One hundred eight students are currently enrolled at the Training Centre, which was inaugurated in May 2008. Hazar Imam encouraged students to continue their education in these various fields which would surely see rewards in a world of increasing competition. Afterwards, Mawlana Hazar Imam visited UCA’s main campus in Dasht, where he reviewed and discussed construction plans for the future development of the campus. The tour included a helicopter ride that provided a broader vantage point from which to view the site. I would like to begin these comments this morning by welcoming you to this most happy occasion, this historic event, to celebrate the laying of the Foundation Stone of this first Ismaili Jamatkhana and Centre in Tajik-Badakhshan. I would like to say how deeply happy I am, that this Foundation Stone ceremony will occur during the 50th year of my Imamat. I can think of few events in this year which will have given me the happiness which this one today will bring me and inshallah all the people who will participate in this event. At the beginning of these comments, it is appropriate to situate here, one of the functions of the Ismaili Centre in the tradition of Muslim piety. For many centuries, a prominent feature of the Muslim religious landscape has been the variety of spaces of gathering co-existing harmoniously with the masjid, which in itself has accommodated a range of diverse institutional spaces for educational, social and reflective purposes. Historically serving communities of different interpretations and spiritual affiliations, these spaces have retained their cultural nomenclatures and characteristics, from ribat and zawiyya to khanaqa and jamatkhana. The congregational space incorporated within the Ismaili Centre belongs to the historic category of jamatkhana, an institutional category that also serves a number of sister Sunni and Shia communities, in their respective contexts, in many parts of the world. Here, the Jamatkhana will be reserved for traditions and practices specific to the Shia Ismaili tariqah of Islam. The Centre on the other hand, will be a symbol of confluence between the spiritual and the secular in Islam. I would like today to situate what the Centre and the Jamatkhana aspires to be in the town of Khorog. It is my hope that the town of Khorog will become the Jewel of the Pamir. The gem cutter, the person who prepares the jewel, cuts it and cuts it and polishes it and cuts it and polishes it until he has fashioned the gem stone in to a stone of absolute purity with no clouding, absolute purity. And the gem cutter has to do his work very carefully with a lot of time, because if he makes a mistake, he can not bring back the part of the stone that he cut away by mistake. And this is what I hope, with the President of the Republic, His Excellency the Governor, we will be able to do over the years ahead, to improve the town of Khorog, to make it the Jewel of the Pamir. And we will seek to improve, all of us together, the quality of the environment in which we live, bringing clean water to everywhere where the people live, bringing energy to all the places where people live, improving the schools and health facilities, improving and restoring our historic buildings which are representations today of our cultural history, and thanks to the Governor Niyozmamadov and his gift of land, we today have a new park in Khorog, inshallah we will build the University of Central Asia, we will build this Centre, and while working together, step by step, we will make Khorog the Jewel of the Pamir. And I want to thank again His Excellency the President, the Deputy Prime Minister, His Excellency the Governor, the Governor of Afghan-Badakshan who has done us the honour of being here today, I want to thank everyone who has made this event possible today. But more than that, who is making new things happen in partnership and in friendship. Like the University of Central Asia, which is a very complex exercise, but inshallah, we will do it properly. And every time I come back to Khorog, I will ask myself: Are we moving towards making Khorog the Jewel of the Pamir? During the night and into the early hours of the morning, murids braved near freezing temperatures to gather and wait. As darkness gave way to bright blue skies, Mawlana Hazar Imam’s helicopter landed and the early morning chill faded. Thousands of murids had gathered at Ishkashim, on both banks of the Pyanj river, for the first of two Golden Jubilee Darbars granted by Mawlana Hazar Imam to the Jamat of Tajikistan. The Darbar was held in the open air of Gorno-Badakhshan, against the majestic backdrop of the Pamir mountains. Following the Darbar, the Jamat waved at Mawlana Hazar Imam as his helicopter departed, before returning their homes. Later in the day, Mawlana Hazar Imam held a joint meeting with provincial leaders from both sides of the Pyanj river: Governor Qodiri Qosim of Gorno-Badakhshan in Tajikistan and Governor Munshi Abdul Majeed of Afghan Badakhshan. KABAR, November 6. Prime Minister of Kyrgyzstan Igor Chudinov and Prince Aga Khan have arrived in Naryn town. The goal of their visits is to familiarize with construction process of the University of Central Asia. The Prince Aga Khan arrived in Kyrgyzstan on three-day visit at the invitation of the republic's government. He had already visited Kazakhstan and Tajikistan within the framework of his tour to Central Asia. The University of Central Asia was established in 2000 within the framework of the agreement between the governments of Kyrgyzstan, Kazakhstan, Tajikistan and High Highness the Aga Khan. KABAR, November 6. Kyrgyzstan's foreign minister Ednan Karabaev met with Prince Aga Khan. During the meeting, E.Karabaev welcomed him on behalf of President of Kyrgyzstan Kurmanbek Bakiyev and thanked the Aga Khan Development Network (AKDN) for rendering material assistance to quake victims in the republic' south. The parties discussed the results of implemented projects and perspectives of cooperation between AKDN and Kyrgyzstan. It was also raised issues about projects, which reflect tasks that set by the President of Kyrgyzstan in his message to the people of Kyrgyzstan. It was pointed out priority directions of cooperation in the field of energy, water resources, work in rural area. The AKDN is interested in construction of small hydroelectric power stations. Issues of building air grounds for development of small aviation were raised during the meeting. The minister said the necessity of setting up mini air grounds and building hangars for helicopters in remote regions of Kyrgyzstan. His Highness the Aga Khan, Imam (spiritual leader) of the Shia Imami Ismaili Muslims, founder and Chairman of the Aga Khan Development Network (AKDN) arrived in Kyrgyzstan on Wednesday, November 5, 2008. The three-day visit at the invitation of the Kyrgyz government is concluding leg of the Aga Khan’s ten-day Golden Jubilee tour of Central Asia, which also included Kazakhstan and Tajikistan. The Aga Khan is scheduled to meet with Kyrgyzstan’s Prime Minister Igor Chudinov, Minister of Foreign Affairs Ednan Karabaev and the Speaker of the Parliament Aitibai Tagayev amongst other officials. The discussions are expected to cover current and future initiatives of the AKDN, partnering with the government and civil society institutions in the areas of economic development, public private partnership, and the strengthening of institutional and human resource capacity. The issues of regional development and stability will be covered at the meetings as well. In the town of Naryn, on November 6, the Aga Khan, Chancellor of the University of Central Asia (UCA) and Prime Minister Igor Chudinov will review progress on construction and facilities development of the UCA main campus. This will be the Aga Khan’s eight visit to Kyrgyzstan. Mawlana Hazar Imam blessed the Gorno Badakhshan jamats with Holy Zaheri Deedar in Ishkashim and porshniv. According to credible info there were 40 thousand murids in Iskashim and 140 thousand in Porshniv 15 km. away from khorog. Ishkashim is about 2 hrs. drive from Khorog. At both sites, the Holy Farmans were the same. (paraphrasing) Mawlana Hazar Imam became emotional in Ishkashim when He said that no mountains, deserts, barriers, rivers can possibly stop the IMAM's love for His murids. The Imam said that the drugs culture and arms culture must never be tolerated and rejected at any cost. The Imam said that Tajikistan has natural resoursces, which AKDN will assist in tapping into. AKDN to engage in 3 domains: poverty, growth of economy and civil society. Leisure industry should be capitalized for Tajikistan's economy. At both places, the Gorno Badakshan Jamat gave gifts of Tambur. In Ishkashim the Imam remarked that someone must have informed that the Imam loves to hear the music of the silk route. Golden jubilee is a day of celebration, rejoicing and happiness. The Imam Himself would be rejoicing with the Jamat. The Imam blessed the departed souls with eternal rest. In Porshniv the former chief Khalifa was seated in front of the Imam on a chair. He is very old and sick. The late Missionary Abualy and I had met Khalifa Shohi Kalon in August 1994. When Mawlana Hazar Imam descended from His Throne, He directly went to Khalifa Shohi Kalon to greet him. The Khalifa attempted to rise but the Imam placed both His hands on Khalifa's shoulders and asked him to sit. The Imam's mubarak Head came so close to Shohi Kalon's head - possible kissed him. Two persons (not from Badakhshan) had a private audience with the Imam while He was leaving from Porshniv Darbar site. It appeared that these murids had come with mehmani/gifts. I saw the Imam blessed them both. In Ishkashim, the Imam went to the edge of Afghan/Tajik border to bless the Afghan murids before departing to Khorog by helicopter. This was a shock for security. Discipline in Ishkashim is beyond description. In Ishkashim there was not a single cloud in the sky. The sun was shinning and the Almighty Allah smiling through the majestic mountains of Pamir. The Imam said that let the light of the beautiful sun shine in your hearts and souls forever.